This week I’m participating in an eating and budgeting experiment started by Tami Hardeman. Along with Molly and a handful of other folks, I’m doing my best to eat and drink from Monday through Sunday night all within a $30 budget. Molly brought Tami’s challenge to my attention over the weekend, and although (or perhaps because) I was immediately scared of and fixated on missing out on specific foods, it sounded like a worthwhile thing to do. I fast for a day every year on Yom Kippur, and I like the appreciation that gives me for a day’s worth of food and cravings. It’s something of a reset on appetites and whims. Tami’s project sounded like an opportunity to do something similar in a slightly different direction. “For most of us, the challenge is enough in and of itself to tame back our spending, to focus on being conscious of our level of consumption, and to be mindful of what we’re eating. 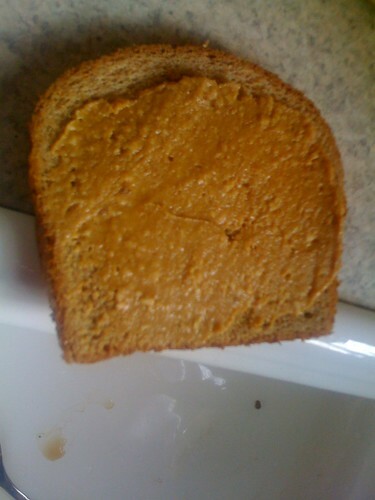 Today’s tally (cost breakdown and analysis later): For breakfast I ate a slice of wheat bread with good peanut butter on it along with a cup of coffee. At lunch I fell off the wagon. I was at an all-day training where work supplied a sandwich from Quizno’s, bag of chips, can of soda, and a cookie. I had half the sandwich, but that still could have blown half the week’s budget. Tomorrow I’ve told work not to include me in the lunch order, and I’ll work on bringing my own. 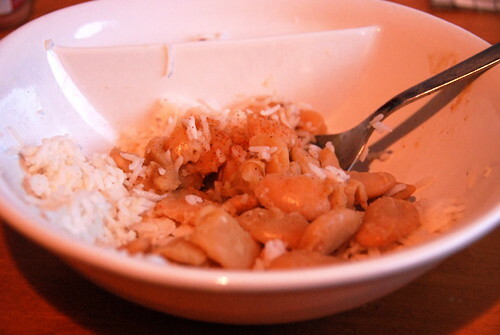 For dinner tonight, I had canned butterbeans sauteed in a little butter, over basmati rice. Molly had the same but with black beans. Both were pretty good. It’s not too late if you’d like to join the project. Don’t worry about the specific weekly budget, or pro-rating the $30. Just think about eating as cheaply as you can this week, and remaining mindful of exactly what you spend on everything you consume. Total for day 1: $2.32. I don’t think eating the lunch provided by your workplace is cheating. I really don’t think anyone receiving assistance would turn down a free meal provided by their work. I have had several minimum wage jobs that sometimes offered an employee meal, like pizza, as the result of winning a sales contest or because we were working late for inventory, etc.